HOT Zulily Coupon Code to save $10 at Zulily.com! 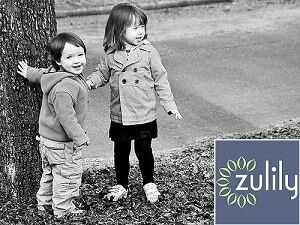 If you're a Zulily lover or a Zulily.com newbie, you're going to love this: I have a brand new Zulily promo code for you to use! Enter Zulily.com coupon code NVBLG105 to save $10 off your purchase of $50 or more! Hurry, this coupon code expires on 11/14. Zulily is fabulous! It's a new online store offering daily sales events on top-quality apparel, gear and other goodies for moms, babies and kids. We carry the best brands at the lowest prices. Members enjoy savings of up to 70% off retail prices. zulily loves to find deals on favorite styles, and we love introducing our members to exciting new brands, too. It's like a ticket to an amazing sample sale. Only members can take advantage of zulily's low prices. Membership is free and signing up is fast and easy. Once you're a member, you'll be the first to know what we've got to offer every day. Each weekday, we offer at least five limited-time shopping events. Members receive a daily e-mail revealing the latest events. From there, members (gleefully!) click to our site and shop. Members can also go straight to the site to shop every morning. Every day is different, so if you're looking for something specific, check back often. Anything and everything for moms, babies, and kids will show up on zulily!